What Is DA Form 3032? 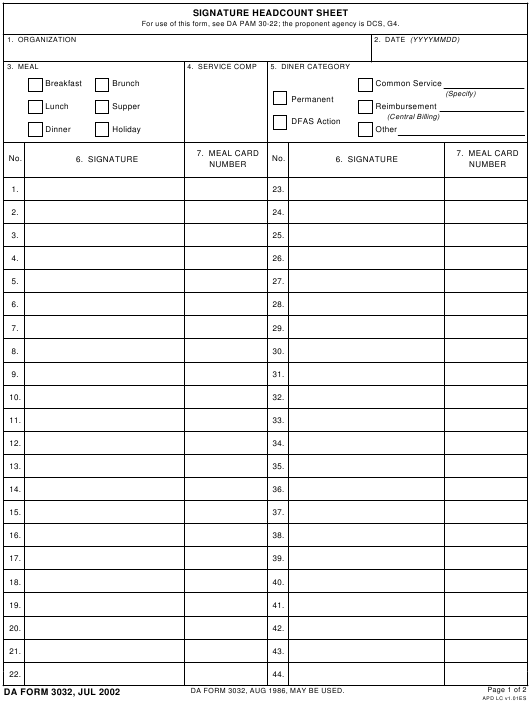 DA Form 3032, Signature Headcount Sheet is a form used for recording the signatures for the meals served for enlisted personnel at dining facilities. Separate forms should be used each day for every meal. Each diner must also be covered on a separate sheet. If the total number of signatures for all three meals per one day is less than 82, only one sheet is needed for that day. At the end of each meal, the headcounter closes out the sheet using the next unused line. The latest version of the form - often confused with the DD Form 3032, Department of Defense Pathways Recent Graduates Program Participant Agreement - was released by the Department of the Army (DA) in July 2002. An up-to-date DA Form 3032 fillable version is available for digital filing and download below or can be found through the Army Publishing Directorate website. The DA 3032 is not classified and is approved for public release and unlimited distribution. How To Fill Out Da Form 3032? For use of this form, see DA PAM 30-22; the proponent agency is DCS, G4. DA FORM 3032, AUG 1986, MAY BE USED. Boxes 1 and 2 require the full unit designation and installation and the correct date, respectively. Box 3, Meal, is for indicating the meal type by selecting the appropriate box. Box 4, Service Component, requires entering the abbreviated letters of the service component from the list provided on the back of the DA Form 3032. The appropriate block has to be checked in Box 5, Diner Category. If the required category is not present, the person filing must select 'Other' and provide a short explanation in the space provided. The Meal Card Numbers are entered by the headcounter in accordance with the DD Form 714, Meal Card. Any additions or clarifications should be specified in the Remarks box. If a late meal is served while the headcounter is absent, this box can be filled in by the dining facility staff. Block 9a - Headcount Signature and Rank - is filled in by the headcounter at the end of each scheduled meal. Block 9b - FOS Signature and Rank - is filed by the Food Operations Sergeant before the headcount data is consolidated and after the form is reviewed. The headcounter crosses out all unused lines after each meal. This is done by drawing a line from the upper left to the lower right in all unused boxes in every column of the form. If a DA 3032 Form is used for two or more meals, the headcount closes out the form on the next unused line.